Haven’t been keeping this blog updated lately – now that I’m into summer hopefully I’ll have the time for more frequent updates. What follows is a flurry of tidbits on recent happenings. 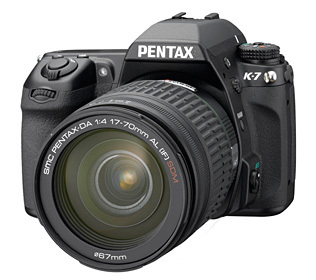 This one caught me by surprise for sure – Pentax just last week announced their new midrange K7, which is their first significant DSLR announcement in over a year. Just as I started assuming Pentax had all but become a bit player in the increasingly crowded DSLR market (with Sony developing the KM/Alpha system into the #3 brand, and relative newcomers Panasonic and Samsung taking the initiative to forge ahead on the cutting edge digital frontier), they come out with a new flagship midrange camera that, on paper at least, rivals and even beats the Canon and Nikon midranges in quite a few areas. A new, 14.6MP CMOS sensor “rebuilt from the ground up”. At the outset, this would seem to be a slightly revised version of the same 14.6MP sensor used on the previous K20D. We’ll have to see how much improvement “rebuilding” the sensor has (my guess: not much), but this is encouraging news – Pentax sensors (the K20D’s 14MP sensor especially) have always produced excellent quality with regards to high ISO, if a tad conservative on the default in-camera noise reduction setting. The K20D also seemed to buck the recent Pentax trend of poor JPEG rendering of RAW images (in other cameras, the in-camera JPEGs were significantly inferior to JPEGs rendered using an off-camera converter like Adobe Camera Raw) – maybe it was simply a different rendering approach to their higher-end midrange cameras, or perhaps Pentax just knows how to deal with raw data from the Samsung-developed K20D sensor better than the Sony chips used in all their other cameras.